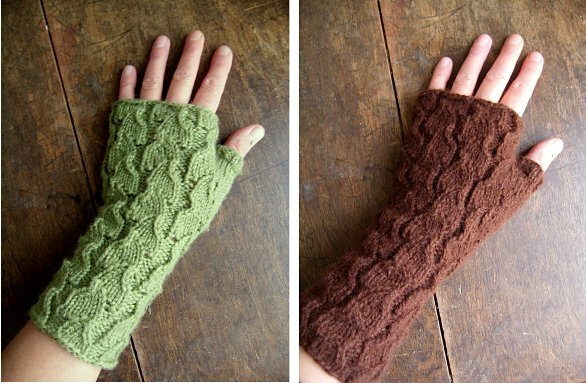 On the left, the small size knitted in DK wool, and on the right, the large size knitted in sock-weight alpaca. Both were knitted on 2.75mm needles. They look great! And what a great project if you only have a small amount of yarn! Love the alpaca one, drool! Great work. I love the green ones and thanks for sharing the pattern, I always forget about Knitty! Lovely - thanks for the link. I've just bought a load of Rowan Calmer which I found in a sale, and don't quite know what to do with it - these could be the answer! They look quite tricky though. They're not really tricky - the pattern is very clearly written, and the lace repeat is quite intuitive after the first few rounds. It's written for dpns but I adjusted it to magic loop (and my horror of starting a round with a purl stitch) quite easily.